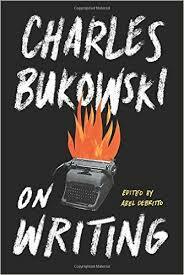 BOLD MONKEY: New Release: Charles Bukowski On Writing. Ecco, 2015. Edited by Abel Debritto. New Release: Charles Bukowski On Writing. Ecco, 2015. Edited by Abel Debritto. Returned from Canada a few days ago after five weeks. Interesting to read yesterday Claudia La Rocco’s New York Times article ‘On Writing,’ a Charles Bukowski Collection of Rants and Musings in Letters (9 August 2015) in which she discusses ECCO’s latest Bukowski release. La Rocco links her review to a 2013 BOLD MONKEY assessment of the Best & Worst of Buk’s posthumous poetry ECCO publications.